On the latest Hidden Shoal mixtape, German ambient artist Kryshe picked tracks from cherished albums he owns on vinyl. The mix traces a line from ’70s German kosmische through to Talk Talk’s majestic ‘Wealth’, taking in instrumental touchstones such as Klaus Schulze, Olafur Arnalds and A Winged Victory For The Sullen along the way. In moving between cosmic synthesized soundscapes and the intimate tones of strings and piano, Kryshe explores the myriad influences that have shaped his own exquisitely subtle and detailed ambient work. 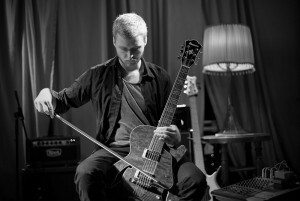 Kryshe is the live and studio-based ambient project of German musician Christian Grothe. Grothe’s music often evolves from live improvisation sessions, incorporating sound-manipulation software such as max/msp to develop a richly layered yet spacious sound. Grothe is also a member of the improvisational trio Unland, featuring ambient artist Jonas Meyer and clarinetist Shabnam Pavaresh. His releases to date are the Dreamland and In Between EPs, and the full-length release Growing. Listen to Kryshe’s music and learn more about the artist here.